Looking to add some fall flavor to your everyday bagel? 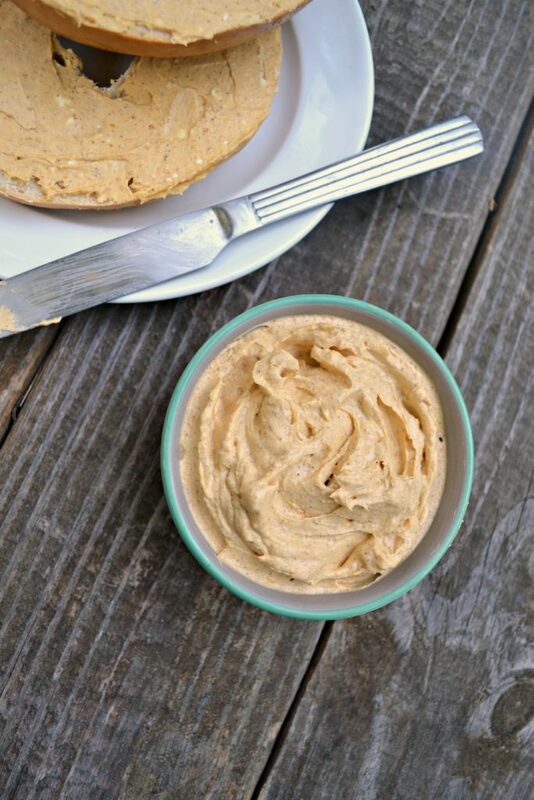 This creamy Whipped Pumpkin Spice Cream Cheese is the perfect festive addition! 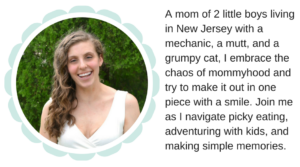 Keep reading to learn how to whip it up in just a minute or two! I thought I could hold off, you guys. I really did. But there’s this weird thing that happens whenever I make something tasty that I think you all would enjoy where I end up completely dismantling my editorial calendar and squeezing it in. Because you guys need it in your lives. That’s how it went with this post. I made this on a whim after I had some leftover cream cheese from making this post. No idea what to do with it and a few cans of pumpkin puree, I thought that it would be an okay combination. I was wrong. This stuff is like pumpkin cheesecake heaven, but without the work. 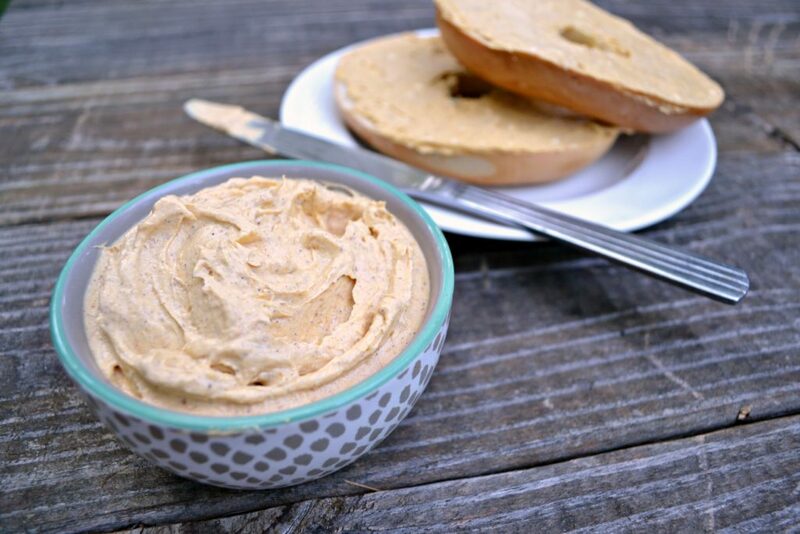 Whipped pumpkin spice cream cheese is delicious on just about everything – from pancakes to a spoon. Enjoy it with a coffee filled with my Sugar Free Pumpkin Spice Coffee Creamer! I would be lying if I told you that I haven’t snuck into the fridge armed with a spoon an embarrassing amount of times. If you love the unofficial flavor of fall, you’re going to be obsessed with this. Oh, and if you use stevia or another sugar-free sweetener, this cream cheese is the perfect guilt-free treat that you can feel good about sharing with your family – I’ve been smearing it on apples for Ryan and he loves it. I’m a fan because it’s got an extra dose of vitamins from the pumpkin puree. Whisk together all ingredients until smooth – a stand mixer works best. For sweetener, I used vanilla stevia but feel free to use whatever you like – maple syrup, honey, Splenda, sugar.. If using sugar, I would suggest using powdered sugar, though! So tell me – your favorite thing to put cream cheese on? Do you like flavored cream cheeses? Do you hate me for posting about fall already? Let me know in the comments! I even have canned pumpkin already! It definitely feels like it’s made the switch to fall temperatures around here; it’s so exciting! Yum! I eat pumpkin baked oatmeal year round so im not judging! 🙂 I can totally make this with vegan cream cheese–this sounds delicious. I love the idea of adding sweetness to make it a dip for apples! I bet it’d be good on toast with some jam! YUM! This is sure getting me in the mood for Fall! I am picking out my bagels as I write! #allthingspumpkin And that’s super easy to make! Oh yum! This is really getting me in the mood for fall. Umm soo I loveeee cream cheese in general but this looks SO MUCH BETTER! I need this in my life!!! Tweeted and pinned! How in the heck have I not ever had this before! YUM!!! i need cream cheese.. i have all the rest!! I can think of lots of things I’d love to slather this on! Thanks for sharing your links with us this week at Celebrate Your Story. I was actually looking for canned pumpkin in the grocery store today, but couldn’t find it. I have to try this recipe! It does sound like a bit of heaven and I can see myself just eating it with a spoon. Pinned this!! I am such a sucker for pumpkin. Posts like this would be great for the Waste Less Wednesday Blog Hop: http://www.skipthebag.com/2016/08/waste-less-wednesday-blog-hop-3.html Thanks! 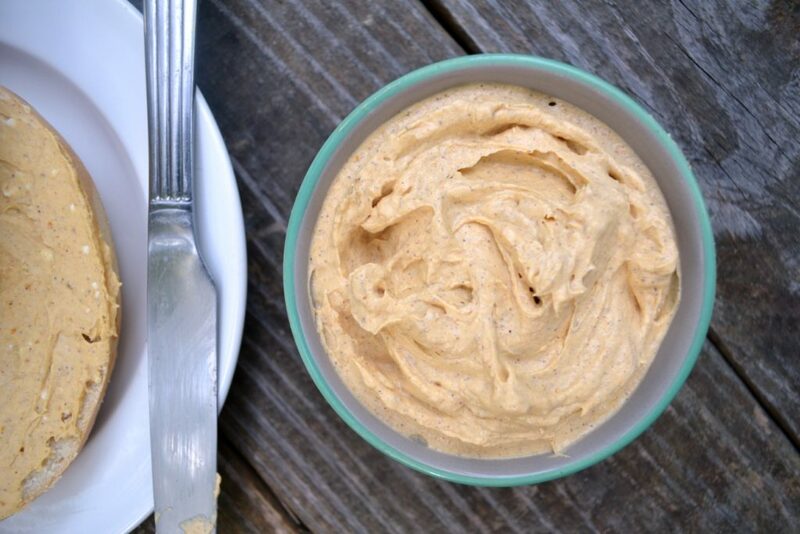 I made some pumpkin spice cream cheese dip last fall and it was amazing. Can’t wait to try out your version too! Yummmm! So simple, I love it. Gonna try this! I LOVE pumpkin spice cream cheese! It is amazing stirred into hot spiralized sweet potatoes. 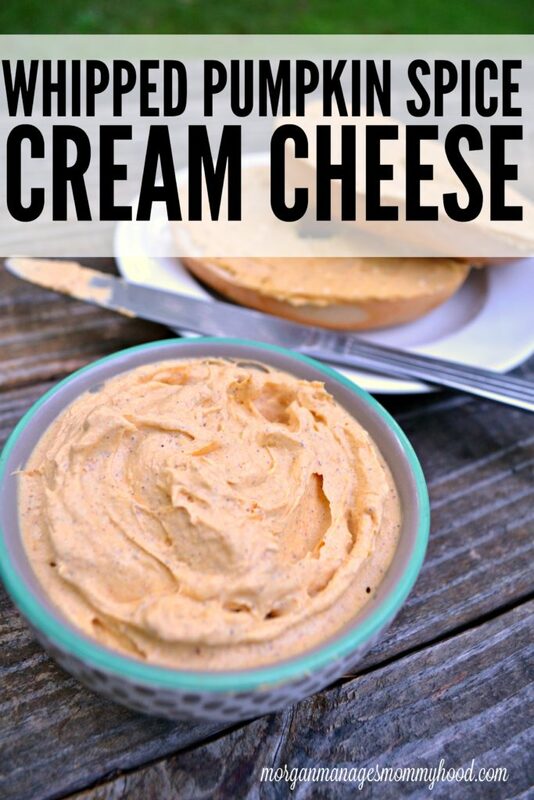 Pumpkin spice cream cheese looks delicious, thanks for sharing with Hearth and soul blog hop, pinning and tweeting. I haven’t made a lot of flavoured cream cheeses before but I’m definitely tempted by this yummy Pumpkin Spice Cream Cheese. Tweeted and scheduled to pin. Thank you for being a part of our Hearth and Soul hop.